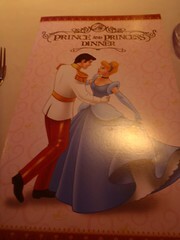 The Prince & Princess dinner was the themed dinner for the Formal Night in all the restaurants. Appetizer – Mik tried the Slow Roasted Duck and Cheese Quesadilla. 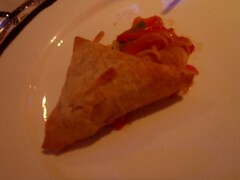 He liked it, although, it was different than a typical quesadilla since it was with phyllo dough rather than a tortilla. Soup – Mik had the Beast’s Potato and Sausage Casserole Soup. Entrée – Mik could not decide between the Oven Roasted Tom Turkey Breast and the Rosemary-scented Medallions of Lamb. He went with the turkey because the sides seemed more to his liking, although we thought sweet Mashed Potatoes meant regular potatoes sweetened and not Mashed Sweet Potatoes, which Mik never likes. In the end, he also asked for some lamb, so he tried both anyways. He ended up preferring the lamb, but still liked the turkey, especially the stuffing with it. 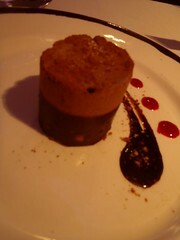 Dessert – Mik choose the Prince Charming Chilled Chocolate Souffle. He had been wondering what a soufflé was since it was on another menu earlier and he had instead choose something else. At least the chilled one was a lot like the mousse dessert.